Topic: can I use five 12v power supplies in series to charge 52v battery? Re: can I use five 12v power supplies in series to charge 52v battery? Short answer - yes, if they are isolated. You will need to either babysit them until your battery is charged or figure out some way to shut them down when your battery gets to a certain voltage. I'm sure there's a circuit for that or something on ebay that will do it. Topic: how do those "Pneumatic-Cylinder-Magnetic-Sensor-Reed-Switches" work? Re: how do those "Pneumatic-Cylinder-Magnetic-Sensor-Reed-Switches" work? Pass a magnet close by it and you should hear a little click. I'm not sure what Chalo just said, because I have him blocked, but I'm sure it was something like "Nya-Nya upright bikes are superior!" I'm thinking either reversed polarity or the charger is shorted. Did it cook all the metal off that side of the charger connector or is it just singed? Ok, thanks. Hooked up the old trusty LiPo charger and after figuring out how to work around the fact that the low battery voltage caused it to think it was charging 5 cell groups instead of 6, it is charging away. 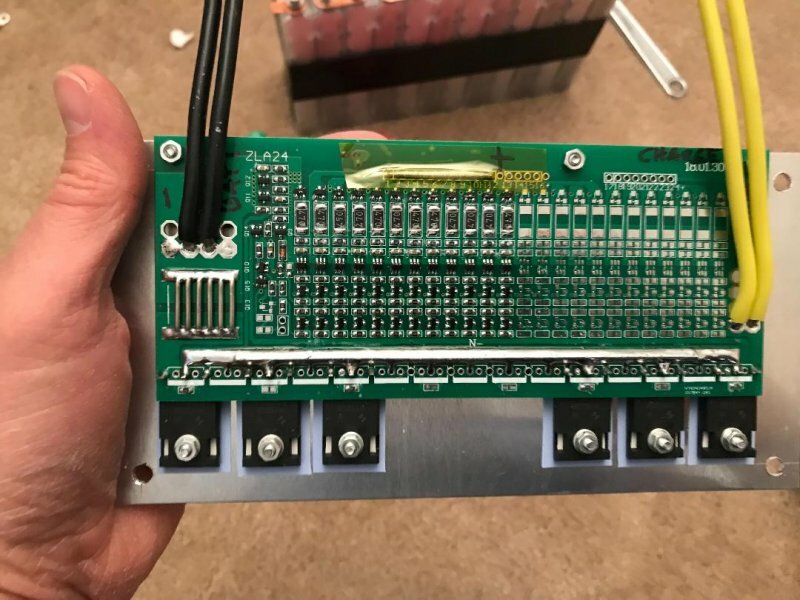 I installed the cut-off switch last night and am ready to connect the BMS. Half the packs are at 4.0V, and the other half are at 3.5V. Do I need to equalize them before connecting the BMS, or can the BMS handle the cell groups with a 0.5 volt differential? It's so close! Here's the bms. The provided schematic was a bit lacking in detail so I labeled the board myself. Build is proceeding slowly. I now have the battery box figured out and mostly built. Hopefully it will come together quickly now. I see a lot of good info if you google "skateboard steering geometry". That's a good idea, I ordered some.